Not all of us can afford to visit a therapist when faced with challenging times or situations, so the next best thing? Yip, this little book will be your at-home, go-to therapist. 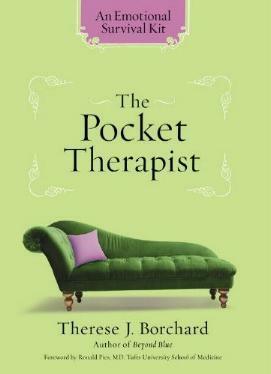 In the Foreword by Ronald Pies, MD, I liked this sentence: "In many ways, The Pocket Therapist is a kind of field guide to getting by in the world—a world in which we often face cruelty, disappointment, and adversity". Author Therese Borchard's book is a combination of shared life experiences, her own personal therapy sessions, tidbits from other people, family, and friends, and even from life in general. She doesn't claim to be "qualified" as such, but to me, I'm all for those who've learned through experience, the greatest teacher of all. She does offer a healthy dose of humor as well. Phew! What would life be like without lots of laughs? She offers 144 "steps" for dealing and coping with whatever you're dealing with: anxiety, depression, stress, addiction, tiredness and anything in between. She takes snippets of advice and quotes from others such as Rabbi Harold Kushner, Dag Hammarskjöld, Rumi, Rainer Maria Rilke, and Helen Keller among many other sages. Lessons I loved include #10 (basically how I live my life: just do it); #19; #47, and #77 (why I get so mad at neighbors whose dogs bark at night). A few of her points are basic common sense, which sadly, is lacking in this country, but the majority of what Therese Borchard imparts is through observation and/or has been expressed by others with wisdom, and are seriously worth reading and absorbing and putting into practice if you'd like some sanity in your life. Visit Therese's blog Beyond Blue at www.Beliefnet.com or her website at www.thereseborchard.com. Conclusion - Good, sound advice we all should follow. A great little "life's helper" we should read from time to time, as it's usually better to learn from someone who's been there and done that.